Ever paint a mani that you love so much that you can't wait to show everyone? That's how I feel about this mani! I love how it turned out soooooo much. I have only attempted one other mani using the drag marble technique, and seeing as I was trying out a bunch of techniques I thought I would have another go at this one. (orange) and Spring Blossom (yellow). They were all applied as a bit of a blob at the tip of my nail and then drag marbled over a wet coat of Ulta3 Lily White. What dances on pastel flames? A Unicorn of course! 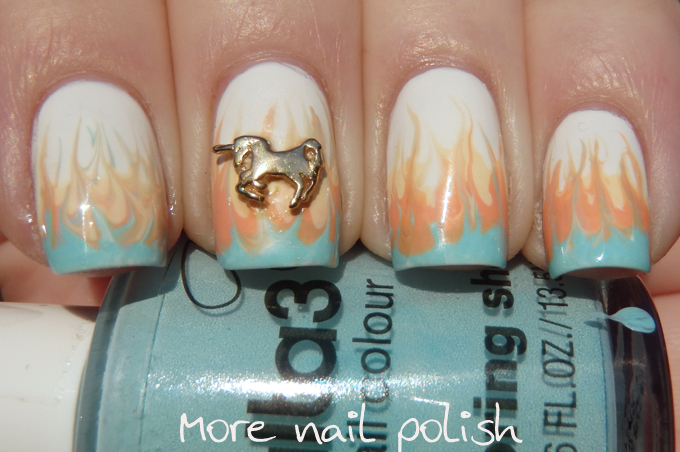 This gorgeous little Unicorn is another one of the Hex Nail Charms that I purchased. It's nicely curved on the nail, but his little horn did still stick up a bit and caught on my clothing some times. Luckily I used nail glue to stick him down, so he wasn't going anywhere until I soaked him off. I didn't film this, but let me know if you want a Instragram tutorial video and I can do one up for you all. AWESOME! And yes I would Love a tutorial! 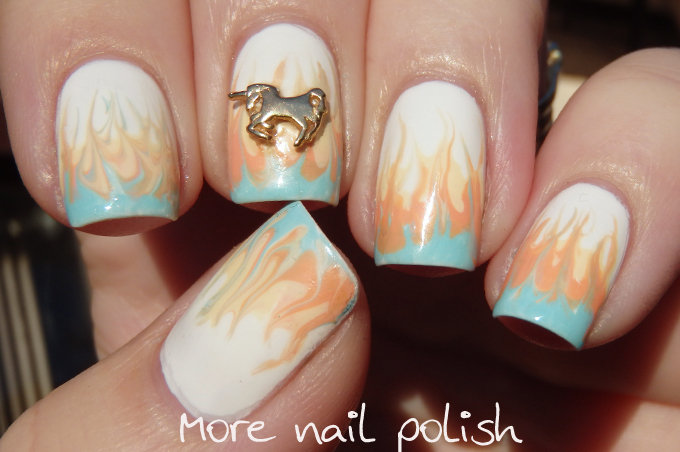 I've tried this and I don't know if the polishes dried too fast or what, but the colors just did not "melt together" (is that a thing) like yours! I'll do up a video this weekend and update this post and put it on Instagram. It's tricky to find the right balance between enough polish to drag and not too much polish that you have a blobby mess. It's so lovely! A tutorial would be awesome too. I love the combination of colours here. I don't know why...they look so creamy and edible to me. Thanks Allie, I'll put together a tutorial this weekend and will update this post and put it on Instagram. Adorable! Love the concept and the combination of colors! This is very cute. 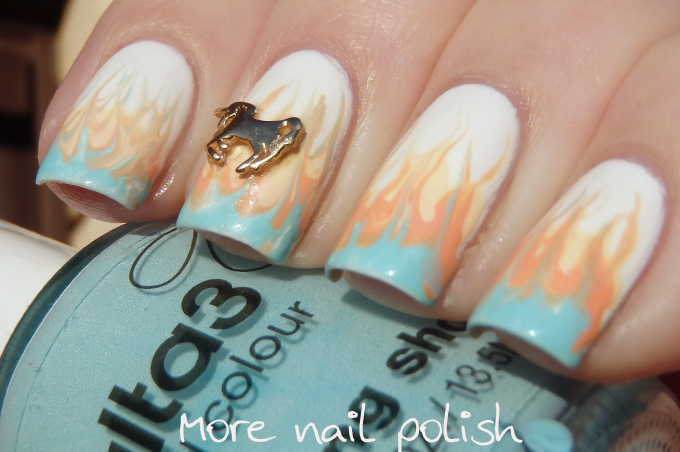 And yes please to the tutorial I just can't seem to get drag marbling to work. Thank you, I'll do a tutorial this weekend and will update this post and put it on Instagram. 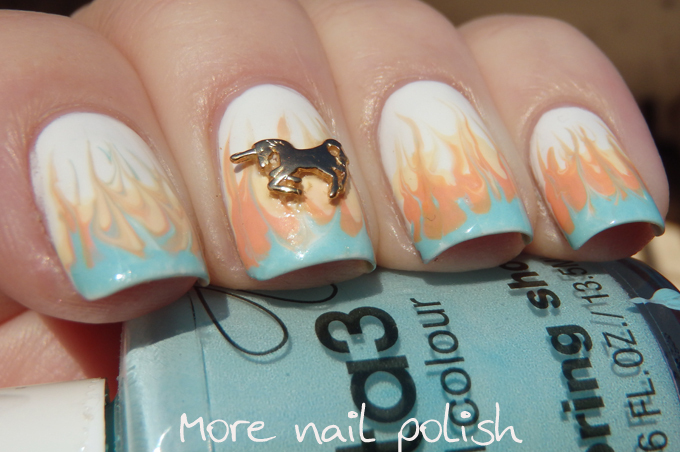 I love that you did the flames in unconventional colors! It turned out really awesome! Just one questions... Did you use a needle or a nail art brush? I always end up gauging my base coat when I've tried in the past. Thinking about giving it a try with a nail art brush but wasn't sure if it will give me the desired look. I started using a fine dotting tool, it it gauged the base, so I switched to a short thin brush and that did a much better job at dragging the colour through without ruining the base. Totally awesome! Love your choice of colors, and the method. Gorgeous photos! This is a drag marble?? It looks SO cool! Love it!